Popovers are a great all-purpose recipe to have in your collection. They’re easy to make, relatively low in fatÂ and require very few ingredients. They have a slightly crisp exterior that opens to reveal a tender, custardy interior. With jam or honey, they make a great breakfast snack, and can also be served plain or with butter as an accompaniment to a savory meal. They are excellent for sopping up gravies and sauces, as well. On top of that, the basic recipe can easily be modified with herbs, spices, extracts and other flavorings for variety. I like to make popovers in small batches – this recipe is for 6 – because I find I get the most consistent results working this way. Most ovens, and especially home ovens, will have hot spots in them and relatively delicate, high rising popovers can burn easily. You can’t turn the pan frequently during baking because the loss of heat will cause some deflation in your popovers, so the best bet is to stick with smaller batches or to test a double batch before trying to serve them to a large group. Popovers will keep for a while after they’re made (although they are best when very fresh) and can even be reheated in the oven before serving, so you can always work ahead and just refresh your popovers before serving. My recipe calls for a muffin tin, but feel free to use a popover pan if you have one. You’ll get the highest rise if all your ingredients are at room temperature before you start to work with them, so try to remember to take you eggs out of the fridge before you start to preheat the oven. Grease a 6-cup muffin tin (or the middle 6 cups of a 12-cup tin) well with the melted butter and place in preheated oven for 1-2 minutes. In a large bowl, whisk together the eggs, milk and salt. Sift flour over mixtre and whisk until smooth. Remove heated muffin tin from oven and divide the batter evenly into the buttered muffin cups. Bake for 20 minutes at 425F, then rotate the pan (to ensure even cooking) and reduce oven heat to 350F. Bake for an additional 10 minutes, until golden brown and crisp. This one calls for a try. Will try it out and reply back Nic! Thanks for sharing. don’t you use baking soda or baking powder? How can dough rise in a photograph if we don’t use baking powder, bi carbonat of soda or yeast..
I’m embarrassed to say that I’ve never ever tried to make popovers, though I love eating them at restaurants. Your recipe looks so straightforward, though, that now I might just have the courage to try them. devletÅŸah – These rise because of the eggs in the batter. They don’t need (or use) baking powder, baking soda or yeast. i absolutely love popovers! i there a way of modifying it so that i can eat the whole thing without having to spread jam or butter on it? for example baking it with mozeralla and sugar (like those cheese breads i see in the bakeries) or chocolate? i ask because i love packing snacks in my bag and don’t fancy carrying the spreads around with me. These look so delicate, great recipe! Alarie – You can definitely experiment with mixing in some grated cheese (cheddar, I think, would work well) and/or some herbs of your choice. I actually like these plain, so I would also take them as-is. The spreads are just a nice bonus! 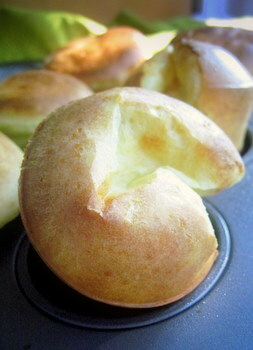 I have never made popovers before, but this looks so easy! Yum…I’m going to have to try these! I just pulled these out of the oven tonight and they surprised me with how much they popped! I can’t believe I’ve never made or eaten popovers before! Can’t wait to experiment with different flavors. I really appreciate that your recipes are reasonably sized if cooking for 1-2, I can’t eat more than one loaf of bread before it goes bad! Some homemade strawberry jam and a bite of ice cream really made these little guys a delicious desert. if I wanted to use popovers for a dessert or a sweet plate, should I add sugar. How much? I love eating popovers but I’ve never tried to cook them myself. I think I’ll try your recipe. I never knew a muffin tin would work. Now i can make popovers, I’m so excited!!. Those look so fluffy and light. I love eating popovers but Iâ€™ve never tried to cook them myself. I think Iâ€™ll try your recipe. I made these today and they were crazy good. I had a minor problem, though. I tried using cooking spray to grease the pan but it burnt while the muffin tin was heating up. Did I just heat it too long? I’ve never had a popover before so I can’t vouch for authenticity but these were really tasty and a quick fix for breakfast. Wiste, try cooking spray made for grilling. It’s formulated to take higher heat. But if I do as you said, devide the batter evenly into the muffin tin, the portion made the tin full. Wouldn’t this make the popover “over-poped”? Looking very nice. This is just what i was looking for, great post. I like your blog also. Hey, i tried baking your popovers, but mine comes out really lopsided! any idea why?